‘Perhaps the most typically American place in America’. (James Bryce, 1888) | A balanced diet . . .
Chicago, Illinois. The Windy City. Where we spent three very enjoyable days at the end of September, having made the trip from St Paul, MN on the Amtrak Empire Builder. Each year when we cross The Pond to visit our daughter Hannah and family (husband Michael, Callum and Zoë) in Minnesota, we try to make a trip to see other parts of that vast and diverse country. In 2011, it was a trip to canyon country in Arizona and New Mexico. Then in 2012, we headed to the ‘Minnesota Riviera‘ along Lake Superior, and the Gunflint Trail. 2013 saw us on the coast of Oregon, then a road trip south to Crater Lake and the redwoods of northern California. And in 2014, we drove to Yellowstone National Park from St Paul. Since we had already made a 2,300 mile road trip around Scotland and the Western Isles at the end of May-early June, I didn’t fancy another long drive. But a short break in Chicago seemed to fit in well with our schedule. And, after all, Chicago is one of the great US cities that has to be in your travel plans at some stage. Until we visited I hadn’t heard about the Great Fire of Chicago in October 1871 when several square miles of the city were destroyed. But this also gave an opportunity to build a better city, and upwards. The skyline of Chicago is stunning, see here from the Milton L Olive III Memorial Park on the shore-front of Lake Michigan. One of the tallest buildings, the John Hancock Center is the black tower on the right. Just click on any of the galleries to open larger images. 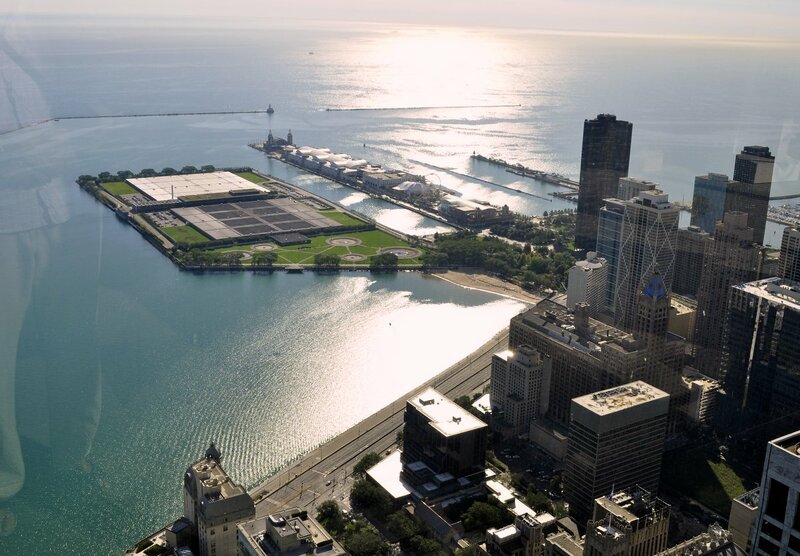 The Milton L Olive III Memorial Park (with Navy Pier in the background), looking southeast from the 360 Observatory. The Chicago skyline photo above was taken from the platform halfway along the park shore. Our train from St Paul arrived at Union Station on schedule just before 4 pm on the Tuesday afternoon, and we were at our apartment hotel, De Witt Place on the northern edge of Streeterville (seen here outlined in red) in about 30 minutes. The hotel was fine, although the bathroom was small and a little ‘tired’. I’d found it through Booking.com that we have used on several times before when planning our travels in the USA. The price was right (USD416 incl. taxes for three nights), and because there was a kitchen we could make our own arrangements for breakfast. A well-stocked convenience store was just across the street. The location couldn’t have been better: just a block from the shore of Lake Michigan (and its miles of walking opportunities), and two blocks from the John Hancock Center and its 360 Observatory on the 94th floor, one of our principal objectives during our Chicago trip. From the corner of N DeWitt Place and E Delaware Place, looking towards the John Hancock Center. First thing on the Wednesday morning we headed to the John Hancock Center, expecting to find a large number of like-minded tourists aiming for the top. I’d read some horrendous reviews indicating that it could take more than 80 minutes waiting for a lift to the top. I’d already purchased tickets online (USD19 each). Just before 9 am we found ourselves at the head of the queue of about a dozen people, and after a 40 second lift ride we were whisked to the top and the stunning views over four states: Illinois, Wisconsin, Indiana and Michigan (and perhaps even as far southwest as Iowa). During the 1½ hours we spent there, it never did become really busy. We enjoyed a cup of coffee looking north towards Lincoln Park and its zoo and conservatory that we planned to visit the following day. Looking east over Lake Michigan, with Navy Pier. North towards Lincoln Park Zoo and Conservatory. The Willis (Sears) Tower, to the south. 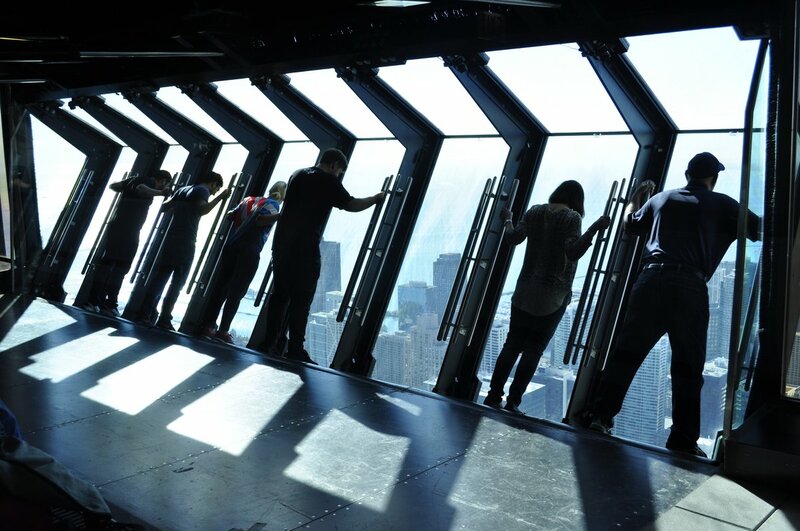 The latest attraction 94 floors up is Tilt. A section of the wall tilts out at an angle of almost 35°! Not for me. I suffer from vertigo, and am never completely comfortable until I’m on terra firma at ground level. Back down, we began our first day’s walking—at least six miles (and almost seven the next day, and four on our final morning). The weather could not have been better, with temperatures in the high 70sF, clear blue skies, great visibility from the 360, and for once, Chicago was the Windless City. We headed south down N Michigan Ave (The Magnificent Mile) towards the Chicago River, admiring the ‘canyon’ of skyscrapers that have sprung up over the decades. One of the most beautiful is the older Chicago Tribune Tower (completed in 1925) with its Gothic, almost art deco embellishments. Chicago architecture is magnificent. I know it’s not everyone’s cup of tea, but I really like these high rise, reflecting the beauty of the buildings all around them. And I never cease to wonder at the engineering and construction that goes into designing and building these masterpieces. Chicago has taken a lot of effort to spruce itself up and welcome visitors. All along The Magnificent Mile, there are attractive sidewalk gardens, and in front of most of the hotels, flower beds are carefully tended. The Chicago Riverwalk is still being refurbished, but is open along various stretches, affording excellent views of all the buildings gracing its banks. There are plenty of places to rest or sidewalk cafes where we enjoyed a light lunch of local pâtés and bread. Among the tallest buildings in Chicago is Trump International Hotel and Tower and, from a distance, it is indeed rather striking. Up close, it’s rather jaded and a little tacky; few of the commercial outlets have been let, and I guess many of the 98 floors are yet unoccupied. Named after Donald, it must take an awfully large ego to have your name in letters on the side of the building, two stories high. Thursday morning. We headed north along the shore of Lake Michigan to Lincoln Park. Destination? Hay-Scented Chain orchid from the Philippines (Dendrochilum glumaceum). Milyassia orchid (Brassia x Miltonia). Giant Butterfly Lily (Hedychium coronarium var. maximum). Then it was almost time to return to the Twin Cities. On the Friday morning we had an early breakfast, and crossed over to the Lake Michigan shore to walk through a ‘haven of tranquility’, the Milton L Olive Memorial Park. Just a short distance from the bustle of downtown Chicago, there were just a few joggers and dog walkers. 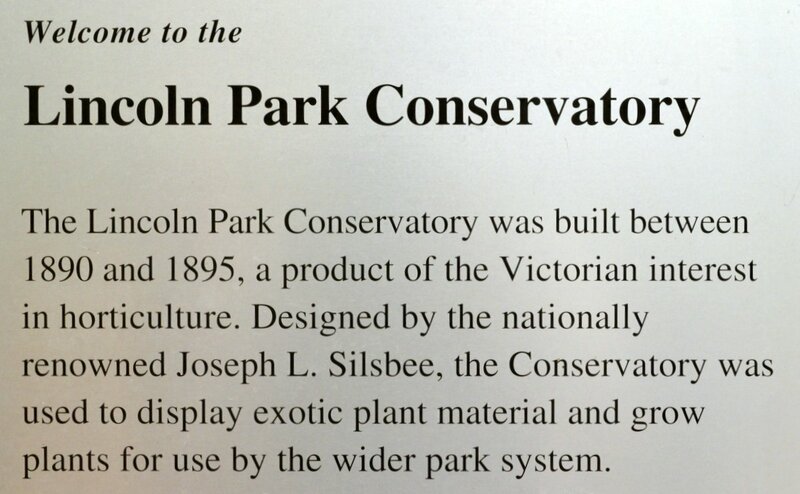 I guess there was so much more that we could have chosen to visit in Chicago—other parks, museums and the like. But we only had 2½ days, and we wanted to walk everywhere. And even though there were so many other attractions we could have taken in, we are quite happy with our trip (including the train journey). We found good restaurants, and convenient to our hotel. But we didn’t get to try the famous Chicago deep-dish pizza. On the other hand, the local Goose Island 312 Urban Wheat Ale was excellent. Would I visit Chicago again? You bet! But there are many other places around the USA I’d like to visit first. This entry was posted in Out and about, Travel and tagged 360 Observatory, Chicago' the Windy City, Illinois, John Hancock Center.